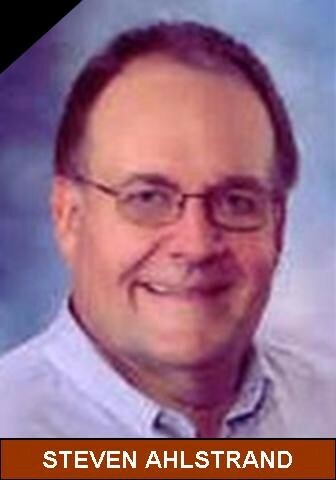 BETTENDORF -- Steven D. Ahlstrand, of Bettendorf, died Wednesday, September 27, 2006, at Trinity at Terrace Park, Bettendorf. Memorial services will be 11:30 a.m. Friday at St. Paul Lutheran Church, Davenport. Visitation will be 4-7 p.m. today at the church. Memorials may be made to the church, the Leukemia Foundation of Iowa or to the Scott County Family Y. Wheelan Funeral Home, Rock Island, is assisting the family with arrangements. Mr. Ahlstrand was born Jan. 9, 1944, in Moline, a son of Reuel and Alice (Carlson) Ahlstrand. He married Phyllis A. Thorne on Aug. 14, 1971, in Dayton, Iowa. Steve graduated from Midland College, Fremont, Neb. He served as vice president of the Scott County Family Y for 15 years, retiring in 2004. He previously was executive director of the Y's in Prescott, Ariz., Canadian, Texas, and Atlantic, Iowa. He received the Award of Administrative Excellence for Capital Campaign Management from the National YMCA. Steve was a U.S. Army Vietnam era veteran. He was a member of St. Paul Lutheran Church, Davenport, where he served on the Memorials Committee, Stewardship Committee and Pastoral Call Committee. He was also a member of the Davenport Kiwanis Club, Davenport and Bettendorf Chambers of Commerce, Association of Professional YMCA Directors and the Y Men's and Women's Service Club. Steve enjoyed construction projects, playing golf and shopping for bargains. Survivors include his wife, Phyllis; children (and spouses), David (Cori) Ahlstrand, Bettendorf, Alisa (John) Carslake, Bettendorf, and Laura (Brian) Bunch, Evanston, Ill.; grandchildren, Natalie and Mallory Carslake and Avery and Addison Ahlstrand; his mother, Alice Ahlstrand Hoover, Moline; brother and sister-in-law, Rev. Kenneth and Marge Ahlstrand, Tucson, Ariz.; sister and brother-in-law, Kristine Ahlstrand and David Murphy, Oakland, Calif.; brother-in-law and sister-in-law, Dr. John and Helen Thorne, Washington, Iowa; and six nieces. He was preceded in death by his father. Online condolences may be left for the family at www.wheelanfuneralhome.com.